· The Time Capsule contains 100 different items that represent a cross-section of technology in today’s India. · Time Capsule includes day-to-day electronic gadgets like landline telephone, smart phone, VCR, stereo player, stop watch, computer parts like hard disk, mouse, motherboard and scientific equipment like rheostat, refrectorscope and double microscope. · The Capsule will remain buried for 100 years. The objective is to give a glimpse of today’s technology for future generations a century later. 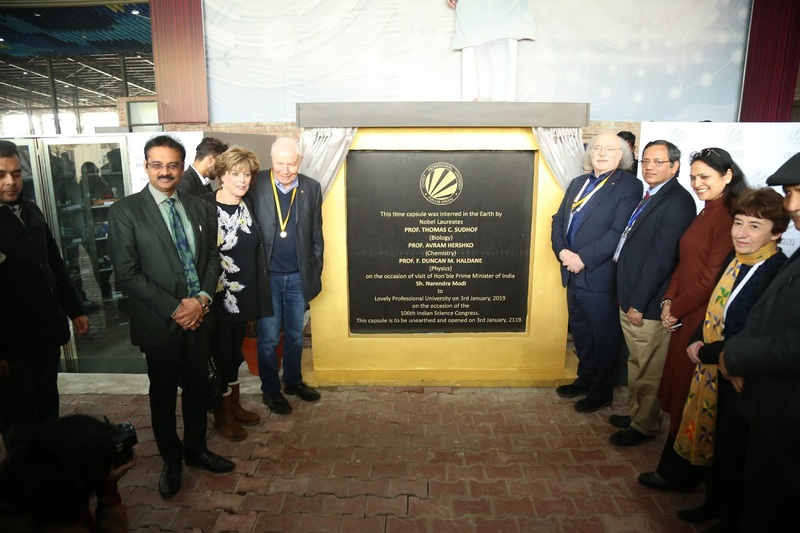 Phagwara, January 04, 2019: A Time Capsule with 100 items representing a cross-section of today’s technology and India’s scientific prowess was buried today at the Lovely Professional University by three Nobel Laureates on the occasion of the on-going 106th Indian Science Congress. The Time Capsule contains 100 items that represent modern-day technology as experienced in India. The Capsule, made by Lovely Professional University on the occasion of the 106th Indian Science Congress, being hosted on its campus, will remain buried for the next 100 years. The objective of the Capsule is to capture today’s technological essence for the future generations. The Capsule was buried at a depth of 10 feet by no less than three distinguished Nobel Laureates- Hungary-born Israeli biochemist Avram Hershko, British-born American physicist F. Duncan M. Haldane and German-American biochemist Thomas Christian Südhof. These three Nobel Laureates are participating in the Indian Science Congress hosted by Lovely Professional University, Punjab. The items that are part of the Time Capsule represent day-to-day technologies used in today’s India- landline telephone, smart phone, weighing machine, water pump, stop watch, headphones, handy-cam, and pen drive. The capsule will also preserve several scientific equipment like rheostat, refrectorscope and double microscope. Some other products that will be preserved include solar cell, a hard disk with latest documentaries and movies. Over 25 students across departments such as Electronics, Mechanical, Fashion, Agriculture, Design, Computer were involved in building the Time Capsule. The items that have gone into the Capsule were selected basis an internal poll amongst students of Lovely Professional University.